Clean your computer and get it running fast and working right. Download Registry Helper and make your PC run like-new again! * Simulation. Not actual scan. Supports Windows™ 10, 8, 7, Vista, and XP! Because cleaning your computer's registry will help make your computer run fast and work right. We recommend that you follow the "best practice" of cleaning your registry once per week to make your PC run like-new again! Your registry is the "master database" where Windows -- and other programs you use -- save their settings. Over time, your registry can become loaded with Invalid Entries that may slow your computer down and cause crashes and errors. Scan your computer today - FREE Trial! Download Registry Helper now to speed up your computer and reduce crashes and annoying error messages. Click here to download Registry Helper now! Registry Helper... Because your computer runs better, without the errors! Thank you for making Registry Helper one of the most popular software products on the Internet! 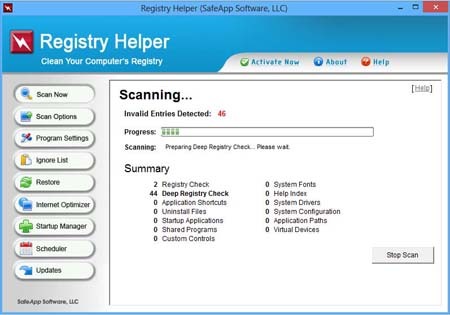 Registry Helper is principally engineered by an industry expert who is a leading author of books about the Windows® Registry.